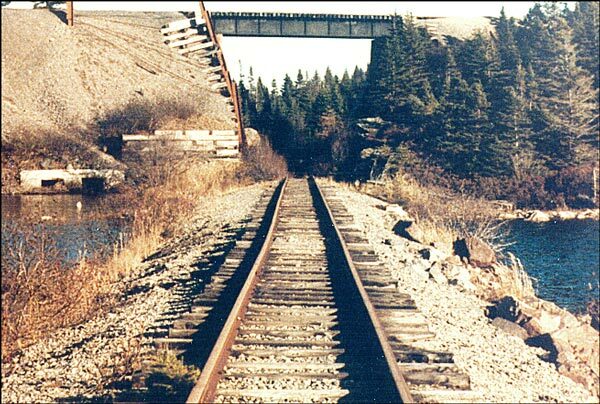 One of the few stretches of Newfoundland's railway left in place after it was closed in the late 1980s, the Trinity Loop was also unique because of its unusual design. A view of the track and loop overpass. Construction of the Trinity Loop started in 1910 and finished in 1911. The loop was built by the Reid Newfoundland Company, which were responsible for much of the construction of the railway across Newfoundland in the late 19th and early 20th centuries. However, the Trinity area proved to be a challenge to the engineers involved with the project. Because of the many hills around the Trinity/Bonavista Bay region, it was difficult to find a route that would go from the high ground down to the tidewater. A direct route would have been so steep that trains would not have been able to climb the grade. To compensate, engineer J.P. Powell designed a loop around a circular pond that would allow trains to descend gradually. This was the only railway loop of its kind in North America. The only similar loops are located in British Columbia, but are hidden inside mountains. The circumference of the loop was approximately 2,000 m. (6,600 ft.) and the drop in elevation when circling the pond was 10.3 m. (approximately 34 ft.). The track was narrow gauge, as were all other train tracks in Newfoundland. The route was in operation from 1911 until 1984 when Terra Transport decided to close the Bonavista railway branch. The original plan was to dismantle the loop and sell it for scrap. However, retired railwayman and researcher Clayton Cook began a vigorous campaign to save it. With the help of some local politicians, he succeeded. Terra Transport turned the loop over to the Town of Trinity. Shortly afterwards entrepreneur Francis Kelly purchased the property, repaired it and turned it into an amusement park with a working train and passenger cars for tourists. The park continued to operate until 2004 when it shut down because of dwindling attendance. The Trinity Loop was recognised as a Registered Heritage Structure in February 1988. Also view Trinity Train Loop Registered Heritage Structure on the Heritage Foundation of Newfoundland and Labrador web site. The Newfoundland and Labrador Heritage Web Site has on its site only a portion of the registered heritage structures in Newfoundland and Labrador. To view a complete list or search for a particular structure visit the Heritage Foundation's Property Search page.